Since finding this Die Cuts With A View sparkly stack earlier this year I have become smitten with using the papers to make cards. I really like how the papers are cute, glittery and very girlie. Plus there's a ton of pink, which is my signature color! 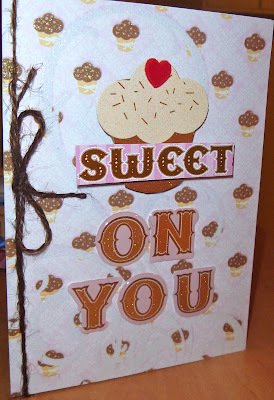 This card was made using DCWV paper, stickers and Jillibean Soup twine. Have you ever used Jillibean Soup twine? If not, you should try it out - Amazing! Again, I love the glittery cupcakes! I'm sure everyone is sensing a theme here, but these papers are seriously wonderful!